The ergonomically designed "Ball Grip" handles fit comfortably in the palm of your hand. This will ensure the operator maximum torque while tightening. The shank is covered with resin for excellent safety. The Tang-Thru handle features a shank that goes through the handle and connects to a star shaped end cap. This allows the operator to strike the handle with a hammer without damaging the screwdriver handle, making them excellent go through screwdrivers, demolition screwdrivers, and striking screwdrivers. 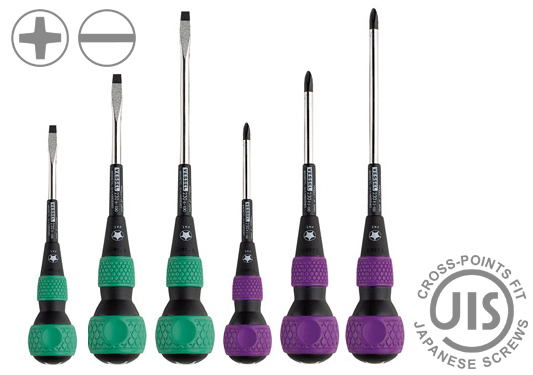 These screwdrivers have a cushion grip that is color-coded by + / - for easy identification , a fully hardened chrome vanadium steel shank, high-precision black point, magnetized tips, and a solid built body for extra fastening power.